Altinco is a Catalan company that develops products for agriculture. They want to do it as sustainably as possible. The ‘Pathway for Sustainable Business’ is a tool designed by Business with Common Sense (BwCS) to integrate sustainability in businesses. Its application at Altinco was highly valued by the members that participated in the four workshops’ of 5 hours each facilitated by the BwCS team. ‘The Pathway’ combines several business design methodologies and incorporates sustainability in all the steps, discussions and thinking done throughout its application. ‘The Pathway’ is dynamic and visual; it stimulates analysis and team work; and gets together different departments and visions. Participants commented,…are ‘tools that help thinking and capturing ideas in a clear and visual way’, or, ‘I learned more profoundly about other areas of the company; their people and suggestions’. The objective is to transform companies to make them more sustainable. Using the ‘The Pathway’ we encourage business operational optimization and the research of new business models and products. One of the most direct consequences of this exercise was participants’ change on the perception and understanding of business sustainability. Sentences such the following demonstrate it: ‘It also gave me a broader point of view when making decisions: how can it affect the environment, other people, etc.’, or, ‘Not only a sustainable business model is viable but it can improve its opportunities and competitive advantages’. Using ‘the Pathway’ we also spurred innovation and we started introducing the circular economy in the company. We improved the existing value propositions, which now match with their clients’ functional and emotional needs, and we defined a new business model. The Total Net Impact, the last step of the Pathway, is a powerful qualitative indicator of business sustainability, with which we evaluated both the environmental and social performance of the company and its impacts, and their contribution to the common good. It allows spotting weak aspects that require improvement, and strengths that should be highlight. We have already finished the implementation of the “Pathway” at Altinco S.L.. !! It’s been four in-depth sessions with representatives from all departments. They have brought an overall understanding of the company’s sustainability. They have also made it possible to share highly enriching ideas and visions, in a relaxed and open work atmosphere. We have analyzed the systemic boundaries, the context and the expectations of the relevant stakeholders. All in all, it gave us useful Information to bring out potential risks and opportunities for the company. We have also developed new value propositions based on the functional and emotional needs of their clients. A new business model, as well as innovation and improvement proposals, have emerged. Finally, we have qualitatively evaluated the Total Net Impact, a useful tool to identify areas of improvement that will allow the company to move towards business sustainability. It’s been a different learning experience for all of us! Business with Common Sense collaboration with the SWITCH-MED project is coming to its end. The project, led by UNEP/MAP – SCP/RAC (a regional agency from the United Nations Environment Programme), aims at fostering the Green Economy across the Mediterranean basin by empowering its key actors: eco-entrepreneurs and green businesses. As part of the second phase of the SWITCH-MED project, the “training of trainers”, we went to Morrocco in July, to Jordan in October and this week we are in Egypt training eleven local trainers on the Eco-entrepreneurship Methodology that was prepared in collaboration with other consultants, including Ecologing, GreenBiz, BwCS and Innedit, at the beginning of this year. This second phase seeks to contribute to the development of a strong ecosystem for eco-entrepreneurship & green business in the Mediterranean. We are sharing an enriching week of practice with enthusiastic young trainers and entrepreneurs coming from a variety of backgrounds and sectors. Through a group-based approach these local trainers are learning how to use the methodology, as they will be in charge of teaching and guiding local eco-entrepreneurs in the transformation of their business idea. We are also exchanging experiences and best practices, learning about the country’s singularities and connecting networks. We would like to thank the local partners leading the work on the ground: the “Egypt National Cleaner Production Center”, “Nahdet el Mahrousa” and the Ministry of Industry and Trade, and all the participants of this training session for their interest, and for sharing with us their good mood, willingness to learn, while looking after us. Many thanks to your warm hospitality! The Eco-entrepreneurship Training of Trainers in Egypt (November 08-13, 2015). Business with Common Sense is taking part in the SWITCH-MED project, led by UNEP/MAP – SCP/RAC (a regional agency from the United Nations Environment Programme), which aims at fostering the Green Economy across the Mediterranean basin by empowering its key actors: eco-entrepreneurs and green businesses. 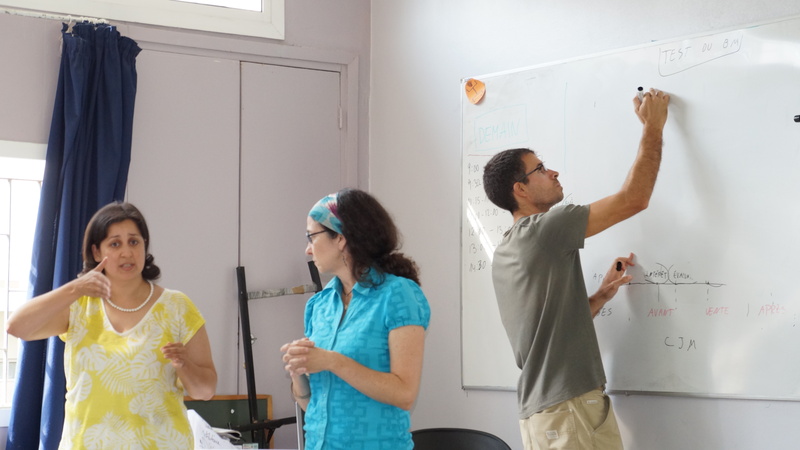 After few months intensively devoted to the preparation of the UNEP’s Eco-entrepreneurship Methodology, in July we started the second phase of the SWITCH-MED project, the “training of trainers”. This phase seeks to contribute to the development of a strong ecosystem for eco-entrepreneurship & green business in the Mediterranean. In July we were in Morrocco, and last week in Jordan. We had the pleasure to share an enriching week of practice with more than 20 experienced trainers and entrepreneurs coming from a variety of backgrounds and sectors. Through a group-based approach we taught them on the Eco-entrepreneurship Methodology that they will use in the training of eco-entrepreneurs in Jordan. We also exchanged experiences and best practices, learned about the country’s potential green niches and connected networks. We would like to thank the local partners leading the work on the ground: the “Business Development Center” -BDC-, and all the participants of this training session for their interest, and for sharing with us their “savoir-faire” and experience while making us feel completely at home. 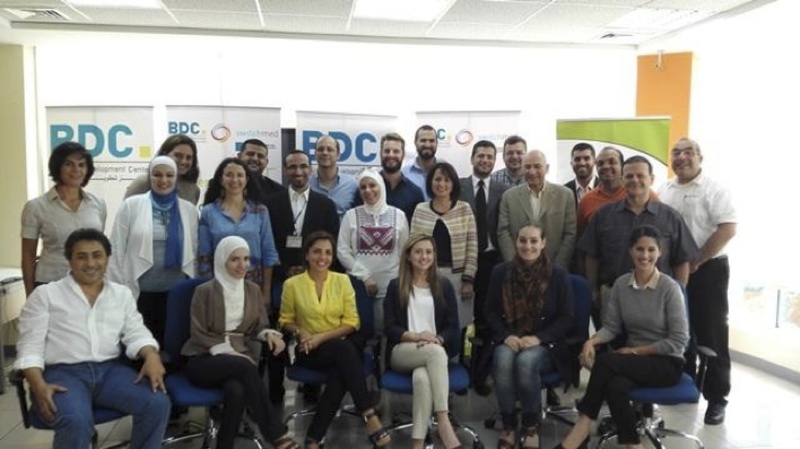 The Eco-entrepreneurship Training of Trainers in Jordan (October 11-15, 2015), with Nicola Cerantola from Ecologing and Ariadna Benet from Business with Common Sense as SWITCH-MED trainers, Jemma Grayburn from BDC, among other participants. Foto from BDC. Business with Common Sense (BwCS) is taking part in the SWITCH-MED project, led by UNEP/MAP – SCP/RAC (a regional agency from the United Nations Environment Programme), which aims at fostering the Green Economy across the Mediterranean basin by empowering its key actors: eco-entrepreneurs and green businesses. After few months intensively devoted to the preparation of the UNEP’s Eco-entrepreneurship Methodology, we just started the second phase of the SWITCH-MED project, the “training of trainers”, which seeks to contribute to the development of a strong ecosystem for eco-entrepreneurship & green business in the Mediterranean. Last week we were in Morocco. We had the pleasure to share an enriching week of practice with experienced colleagues coming from a variety of backgrounds and sectors. We exchanged experiences and best practices, assessed the country’s ecosystem and its potential green niches and connected networks. Through a group-based approach we taught them on the Eco-entrepreneurship Methodology, prepared the work ahead regarding its adaptation to the Moroccan context, and began organizing the training of eco-entrepreneurs. We would like to thank the local partners leading the work on the ground: the “Fondation Jeune Entrepreneur” -FJE- and the “Réseau Marocain de l’Économie Sociale et Solidaire” -REMESS-, and all the participants of this training session for their interest, and for sharing with us their “savoir-faire” and experience while making us feel completely at home. Ariadna Benet (middle of the picture) at the one the trainings in Morocco. This year we will be present at the Postgrau en Economia Verda (http://incev.cat/postgrau/informacio/) organised by the Universitat de Vic and the Col·legi d’Economistes de Catalunya. The Postgrade started in March 2014 and it is currently at its end. It is addressed to professionals and technicians from the public and private sectors, in order to provide them with specific training in relation to all aspects that impact the green economy, with specific emphasis in experiences and practical cases. Thursday 19 of February BwCS will participate in the last module dedicated to green economy policy. We will give a talk on sustainability and Innovation, where we will demonstrate how the transition for sustainability is a continuum of innovation that promotes contextual changes, including policy. We will show examples from B-Corporations and the Economy of the Common Good, and we will introduce, the Pathway, our tool to (re)design sustainable business models framed within the new business paradigm. As you can see, we continue working to create a new economic System, one that respects both the Society and the Environment.